It was a historic event last May 19, 2017 when Japanese ambassador to the Philippines Kazuhide Ishikawa led the turnover of twenty four (24) hybrid cars to Secretary Alfonso G. Cusi of the Department of Energy under Japan’s Non-Project Grant Aid (NPGA). The grant funded the acquisition of the Toyota Prius cars which have lower carbon emissions compared to an internal combustion engine car. 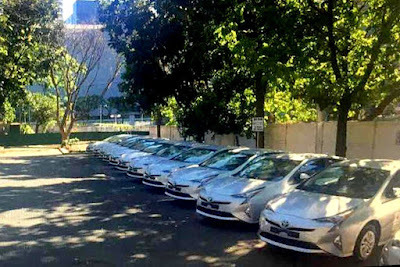 “This Japanese government-aided grant will jump start our drive towards our call to action to our fellow public servants to increase their use or start patronizing the use of energy-efficient technologies, including for their official vehicles. We have to be the role models in this cause, so our people can look up to us and follow our lead,” said Sec. Cusi. The hybrid cars will be distributed to different national government agencies such as the Department of Trade and Industry, Department of Foreign Affairs, Department of Environment and Natural Resources, Department of Transportation, Department of Tourism, Department of Science and Technology, National Economic Development Authority, Office of the President and the Philippine National Police for promotional purposes. Other units will also go to various government offices in Region 8 such as the Bureau of Fire Protection, Philippine Information Agency, Philippine National Police and the Regional Disaster Coordinating Council in support of the economic recovery, rehabilitation and social services programs of communities devastated by Typhoon Yolanda. Officials of EVAP were there to witness the event including EVAP President Rommel Juan and Director John Lee. They were joined by DOE Asec. Atty. Bodie Pulido who was also formerly the executive director of EVAP. Juan says that the domestic electric vehicle industry is happy that these hybrid cars will now be used by government agencies. “We feel that any additional electric vehicle or hybrid vehicle on Philippine roads is a step in the right direction and will help catalyze the industry. The best advertisement for EVs is seeing them running on our streets”. He adds that this is also EVAP’s main intention in co-organizing the upcoming 1st ASEAN Electric Vehicle and Hybrid Summit happening on June 29 to 30, 2017 at the World Trade Center. “We will be seeing more mainstream EV and hybrid vehicles on display from the major automotive companies. This will surely promote the use of these low carbon vehicles and promise a better and greener future for our country”.